Killing Time Before The War. Returning to Hollow was a slightly unnerving affair. Friends and family from childhood start to avoid you when you've spent the last couple of years travelling the world fighting monsters. I didn't think my appearance was all that different, although my hair was a rather electric shade of blue, slowly whitening, but my equipment must have looked a little intimidating. Tries needed a bit of shaking up, he'd been alone in the village for far too long, so I headed over to shake him up a bit. As expected, he had two young girls wrapped around him, and was telling them somewhat exaggerated stories about his own heroism. I shooed them away, making a note to warn the girls in the village about him later. I showed him a copy of the map that we'd obtained, the transport circle mappings translated onto an old map of the realms that I'd got from my father's study. Tries told me that the area I'd maked was typically viewed as "dangerous territory" by the Drow civilisation, somewhere to avoid at all costs, and never monitorred. Tries had no idea if the area was even connected to the city. Interesting. We simply had to visit. A short hop later we were back in a dungeon. A dark, dank, underground keep, disused corridors, dust, dripping water and burnt out torches. All the cliche, none of the charm. Terato was particularly unhappy. I won't go into too much detail on this place, the practices of the former inhabitants frankly disgusted me, but the theme of this place revolved around several simple premises. Firstly, and most obvious, was the use of undead. It seems the Zentharim, (an old nation of people who had built this place, almost universally evil,) prided themselves on their necromancy, using the undead as tools for even the most basic of acts, most notably, as furniture. Much of our time exploring the keep was spent dispatching these creatures and finally sending their souls to a much yearned for rest. Secondly, there were traps. The Zentharim had a peverse sense of humour, desiging traps to kill people in the most terrible of ways. Some of the traps were meerely unintelligable, I mean, what use is a trap that reverses gravity? Argent found it fun to play with, but it served little practical use as far as I could tell. Thirdly, the Zentharim seemed to have a fondness for intefering with forces far too powerful to be played with. The first creatures we discovered in their keep were a trio of battle-wights, beholden to the Zentharim through a complex contract that risked far too much. Vincent and Argent made an arrangement to liberate them from their former contract in return for a significant and lengthy service in our favour, to be determined at a later date. More notably, the Zentharim had what Argent referred to as "a timeshare altar" - used to worship gods relating to both Demons and Devils. The altar was in a sealed off annex of the keep and her destruction of it resulted in the blood war breaking out in full force in the room the altar had occupied. We vacated that part of the keep, and fortunately the fighting was contained. Despite all this, we finally managed to explore enough of the keep to find our way to the tunnel system leading to the drow city beyond. Of course, nothing is ever simple. Between the keep and the tunnels there was what could best be described as "a farm". I saw a farm... the creatures living on the farm were giant... slugs. The farmers were living rocks, and they attacked us. It was all a big misunderstanding of course. After defeating the "Galeb Dur" we moved on and met the head farmer, a titanic creature known as Earthaus. When I say 'Titanic' I mean that in a literal sense, as he was an earth Titan. It took him quite a while to wake up. The debate was lengthy, mostly I spent my time fast-talking, but Earthaus spoke very slowly, in a measured pace, a rhythmic meter, in a deep rumbling voice. It was musical, just listening to it filled me with a warm fuzzy feeling making it hard to concentrate. Nevertheless, I managed to apologise for our defeat of several of his workers, explaining how they attacked us first. Fortunately, it turned out that they were simply elemental creatures, and we hadn't caused any permanant harm. Erthaus beautiful voice was easily explained, his profession before the cataclysm was that of a bard, and he was a master of his craft. Once we'd settled in around the fire he told us the story of how the earth titans came to be, and asked us a few questions about "current events" in the world. For Erthaus, "Current Events" was everything that'd happened in the last 100 years. He was very interested in finding out if we'd observed any para-elementals in our travels, but we hadn't seen many, by Argent's understanding of the term. We promised to keep an eye out for him, or for any mage capable of casting raw elemental spells of an element other than earth. The whole time was very pleasant, but we had work to do. Erthaus knew the local area pretty well, and gave us the information that we needed, mainly that the local tunnels led to a gate into the drow city, and the approach was unguarded. Erthaus didn't get on with the drow, he left them alone. They were terrified of him, so they left him alone. We could take people through here, we could get into the drow city without them expecting us. Back in Hollow, the plotting began. We knew we had under a month before the Drow army attacked, and a little under two weeks before the Dwarven army arrived. We knew that there were active worhippers of Veron in the Drow city of Maerimydra , and that worshippers of Veron were unlikely to be happy with the current pollitical make-up of the city. We knew that we could get to the city, but that was it. Firstly, there was the Princess, and her handmaidens. Each of those handmaidens (of which there were about twelve) vyed for her attention pollitically, and they ran the city. The direct servants of the handmaidens were marked with a lash from a tentacle-whip, leaving a very specific mark. Those bearing the mark could walk around largely unchallenged, and most people on seeing the mark would avert their eyes. An albino drow could rise to this position, and therefore it was the role I would take. Tries would be able to fake the mark well enough to pass most inspections. Secondly, the organisations in the city were largely split between three castes. The Priest caste that worshipped Lolth were largely in charge, and other religions were outlawed. The mage caste largely stayed in thier university and devoted themselves to research. The army caste trained, but had little to do. None of the castes particularly liked the others. A slight as much as attacking the city (as we had done) would cause them to unite against their oppressors, and most likely flatten our small village, even with the force we had. However, if we were to provide a distraction capable of diverting the attention of the mages and the army, then the attack on hollow would be simply led by the priests. Our force could probably defeat that assault with relative ease. Now, if we were to kill all of the attackers in that situation, we'd bring down the wrath and full might of the city upon us. However, if we were to simply humiliate the attackers, without causing "too much harm" - then the embarassment to the priest class could be enough to spark a revolution. The trick would be to defeat the army of slaves, but send the priests back home humiliated and beaten. All we'd need is a suitable distraction. Of course, our contact would be much better in tune with pollitical currents in the city, and have a better idea of what kind of distraction we'd need. A good start we had to work on was some kind of magical accident in the university, or a slave uprising, or perhaps the kidnapping of a low-ranked official in one of the other organisations. Putting a New Face on Things. So, time for the disguises. If you'd have told me this time last year that Argent and Vincent and the others would dress up as my slaves, I'd have laughed so hard I'd have strained something, but that's how it went. Argent had a large supply of slave collars, (deactivated, of course,) and we had a reasonable amount of drow silk that we'd taken from the pavillions. Argent disguised herself as a reasonably highly ranked slave, well dressed and intelligent, to take my orders and relay them to the other slaves. As a part of this disguise, Argent also performed rituals to allow us to speak the drow language and undercommon. Vincent, Marigold and Terato disguised their armour and weapons with rags and collars. Nobody would look too closely at a slave, so they'd do reasonably well. Terato also converted his bow into a yute in order to carry two large pails, which he filed with the vilest smelling substances he could get hold of. Anyone delaying us for a suitable length of time would be subjected to an eye-watering treatment. Ayeena and Breakfast were more difficult to disguise, it's not like Ayeena would remove her platemail, and with the best will in the world, a dire badger is pretty obviously a dire badger. Tries assured us that placing appropriate runes on the platemail would make Ayeena look like an animated suit of armour, if she glowed enough, and that a control rune on Breakfast's head would mark him out as a control beast, one that a high ranking drow handmaiden could enter into the consciousness of at any time in order to observe how her servants were getting along. Perfect for putting the wind up anyone who got too suspicious. The less said about my costume, of course, the better. Maerimydra was a very warm city, and the drow had very little sense of shame. The more highly ranked one was, the less one wore, and it was important to conform. Decency came a poor third to fashion concerns and the need to ensure that my "scar" would be clearly visible at all times, and I don't think letting Vincent and Tries design the thing helped much. Nevertheless, once the scar makeup was complete, Tries found it very difficult to look in my direction at all, naturally feeling inclined to avert his eyes and mumble apologies in my presence. If the costume had this effect on everyone, this mission would be a cinch. Oh, the hairpiece was quite pretty. We waited for the dwarven army to arrive, and briefed them on the situation, should we not be able to make it back to the surface in time, they would create a dungeon throughout the dwarven mine for the dwarves to attack through. If the drow were to attack, they wer enot to be killed, but simply captured, then sent home after suitable humiliation. We took a couple of doppleganges with us to bulk out the slave party a little more, and they'd be able to take on different guises as we moved around, so that it'd look like we had more people with us if we bumped into the same person twice. They took the forms of troglodytes by default, as these seemed to be the most common slaves the drow had. Travelling through tunnels to the city, we came upon an entry guard post, a few orcs and troglodytes. Of course, they didn't remember us leaving the city, so we needed to do some fast talking in order to get through. I used it as an opportunity to get into character, plenty of foot tapping, and impatient swishing of my scourge and they were suitably intimidated. I needed to work on my superior attitude a bit, but we pulled it off. Halfway through the conversation I got impatient (and a little worried that our cover was going to be blown) so I simply resorted to a "You dare question ME? - That seemed to do the trick. I felt a little dirtier every moment I played this act, but it was important to keep it up. The trip to the army headquarters was largely uneventful, the city was huge, but very sparsely populated, most of the streets were completely empty, and I guessed that less than one-in-ten buildings were in use. The central palace and university were things of great beauty, and the great cavern was lofty and seemed to stretch on forever. It was also extremely hot down here, and I quickly became glad that my clothing provided no warmth whatsoever. The only trouble en route that we found was a caravan of one of the handmaidens themselves travelling the other way. We moved to the side of the street as quickly as we could to get out of the way of the palenquin, but one of the more senior looking drow in the group broke off and interrogated us afterwards. How dare we get in the way of his mistress? - I insulted him quite a lot and blamed him for the incident, pointing out that if we wanted us out of the way properly he should have had people moving ahead of his group to ensure it. He looked about ready to stab us, but instead opted to simply ask us which handmaiden we worked for. I picked one at random and smiled inwardly as I saw him resolve to cause that house trouble later on. Internal strife was nothing if helpful to us. Within the compound, I took Vincent with me, and detailed the rest of the slaves to wait outside. I realised that the worshipper of Veron would be unlikely to want to negotiate with someone of my appearance. I marced Vincent to his room, knocked and entered, then when seeing the general was alone, I crisply ordered the slave to deliver his report, then retired to the lobby to sit and wait, while reading what appeared to be a local paper. The slave informed me that an appropriate plan would be to kidnap a relatively minor mage within the University - the lecturer in dimensional magicks, a pathetic discipline hardly useful to anyone, but then, when did the mages ever manage to accomplish anything. No matter, this time tomorrow the mage would be in our clutches, and we could leave this cesspit for better civilisation. Of course, the pathetic excuse of a University was inefficient as ever, and it was likely that we'd have to drop in later in the day, when the lecturer finished with his duty. We passed the time in a stinking hole of a building a couple of alleys back. Better not to let the other houses see what we were up to. A number of creatures seemed to in habit the building, fugitives from the law, but dispatching them would have been more trouble than it was worth, and if one escaped and made a fuss, our plot would be exposed. They had the gall to accuse me, me! of being a fraud, but a few veiled threats and a brandishing of my whip convinced them not to push it further. Of course, they had a problem with some otyughs in the basement, so we made a little sport of excecuting them while we waited. Let the otyughs form a guild (As they were planning) and we'd have trouble all over the city. Navigating the University was more of a problem than it should have been. Couldn't these idiots put up proper signs? Our progress was further impeeded when some peons with no proper feel for rank detained us in order to ask questions about the war clank. Apparently my slaves had utterly failed to remain below the attention of the authorities while I had been inside the Fighters' Guild. Pathertic. I'd have to have them excecuted later. My secretary managed to disuade them from causing too much of a fuss, and we finally made it to the corridor where hopefully our quarry waited. An impatient knock and a rather angry conversation through a doorway was followed with the sound of furniture being shifted around, and finally the mage upened the door and allowed us to enter. As soon as we were inside the office, and the door was closed, the mage indicated that we were not being overheard. I dropped the facade. Phew! There's only so long you can keep that kind of thing up before it really starts to affect you, you know? If I could help it, I never wanted to have to put on that act again. We explained the plan to our new acquaintance, and he agreed to it with only minimal persuasion. I suspect he was a little bored with his current lot and yearned for his adventuring days again, as he immediately went to a disused cupboard and geared up for an adventurer like any seasonned professional would do. With a genuine drow on board, I could drop the act, and redisguise myself as another slave. I didn't tell them about how terrible my thoughts had become leading up to that moment. Gods above it felt good to be back in scale. One important thing remained for us to do, we needed to make it look feasable that we'd kidnapped the mage. Of course, simply walking out would look suspicious, so we listened to his advice, and agreed to teleport accross the city from the University to another circle near the boundary, then simply walk out. Along the way to the University circle, we'd fake a magical accident (the explosion of our now suspect war-clank) - the mage throwing up an illusion to cover our tracks. Things went largely to plan, although more security than we expected on the near end left us a little the worse for wear, and greedy guards on the far end required a significant bribe in order to be helpful. It wasn't long before we were nearing the edge of the city, where another checkpoint would await us. It was at just this moment that a shout was thrown up from behind us. Apparently the army had finally caught on to our scheme and were giving chase. I saw our friendly general leading the way, and suspected a betrayal until he signalled for a couple of archers to fire at our group. The distance was impressive, and the shots were all the more impressive when they neatly passed through our group and took two of the guards on the guardpost in the head. I think I saw the general wink, and we made a break for us. It turns out that his archers were terrible shots... no matter how hard they tried to hit us, they just kept hitting the guards instead, and it only took a few more arrows before the remaining slaves on the gate decided that it must be them who were the hunted, and they fled. We scarpered into the tunnel system before we could be caught. The boudoir itself was more than we bargainned for. Animated furniture might sound funny, but it's not. The cushions were stuffed with barbed wire, for Tymora's sake! Marigold barely survived. She always said that book learning would be bad for her, and I never believed it until now. We finally managed to turn the tables on the assailants though (well, demolish the tables) and eventually the wrecked remaines ceased to attack us. The dragons had an extensive tunnel system, with many caves, and many sleeping dragons. The old addage "let sleeping dragons lie" is all well and good, if they're not lying across your path, and very light sleepers. Fortunately the one we woke up made the mistake of pretending to be the elder dragon in their conclave. Our meeting with the dragon under the cities of Halt and Rest proved useful, and we'd heard of this dragon, and knew it must have been much larger and more impressive. Not being in the mood to really negotiate tribute with the creature, I resorted to simply shouting at it until it backed down. We could have taken him anyway. The entry cavern to the tunnel system posed another problem, there was a significant warding on the entryway. Argent faffed with it for sometime while the rest of us looked imposing at the myriad of tunnels leaving our cavern. There were kobolds in the shadows, so it seemed worthwhile. Eventually a large explosion occurred - and we ran for the exit. A noise that loud was unlikely to let sleeping dragons lie for long. As we scattered, blinking in the burning light of the overbright, three things struck me at once. I'd been indoors for far too long, and almost blinded by the light of day. It was extremely cold, and there was the voice of an incredibly angry dragon roaring "Do you kow what you've done?" somewhere not too far behind us. We broke for the treeline, and managed to get out of sight before we were caught. The gathering at the village was a sight that made my heart soar. The different cultures mixed together, the people we had met on our travels, everyone had decamped to this little village at the backend of nowhere, to come together to fight as one. The Free People had brought their entire caravan to the village, they had more structures than we did with all their wagons camped together. The combined Dwarven army of Halt and Rest had sent all the troops they could afford, their armour glinting in the sun. Their camp positively shined, the reflected sun almost blinding as you approached. It was noticable that they hadn't brought the entire force with them, but only if you knew what to look for. The people of Hollow had obviously been training with them, as every young man or woman in the village carried a sword or a crossbow. Scardale Keep and Yare had both sent troops as well, and they didn't so much have a camp as they were staying in tents around the village. The different cultures were largely keeping themselves to themselves, but the Inn at the centre of town had been converted to a makeshift command HQ, where the leaders were staying, pouring over maps, and debating how to approach this upcoming war. I suppose the Dwarves had set it up, they were so organised. I had a lot of admiration for their people. We joined the assorted leaders at the table and began to plan. Discussions lasted way into the night. We had three particular concerns. One was how to best utilise all of the different kinds of people we had at our disposal, that was something the dwarves had been working on for some time, and they had huge complicated plans for using everyone to the best of their ability. The people from Hollow for example, were largely employed in carrying fresh supplies to the front lines, and bandaging wounds, and taking the injured to a field hospital at the town. The second concern was where the best place to fight the drow army would be. We eventually resolved that the pest place would be at the mouth of the dwarven mine. For one, their army would have just fought their way through a large number of traps they'd already set up. For two, most of them would have never seen daylight, and the transition from light to dark would disorientate their troops. For three, they'd be fighting out of a norrow exit towards the dwarven meatgrinder, a shield wall and a crossbow line. The dwarves could best fight an army that could only approach through a narrow area. And so, with the help of a dire badger and a large number of shovels, we made a side-tunnel, circumnavigating the oncoming army. With the help of Anaris' insect-borne eyes and ears, we avoided our foes and crepy around behind the army to where their leaders camped, and we waited and watched. Battle was joined, and the noise from above was deafening. We waited for the drow to send their runner to the front lines, and then we made our attack. The three of them were caught with the smallest of guards, a few slaves, a few hellhounds. We captured them with ease. There were three of them, and as we secured the restraints on their slumbering forms, we realised that the only way to return to the village was through the enemy. We returned as far as we could through our tunnel, then broke for the mouth of the cave. Breaking into the sunlight, we say that the army were largely split into two groups. The first was their front line, engaged on close-quarters combat with the dwarven line. They made their stand about halfway up the trail that led to the old mine. To our right lay sheer rock wall, to our left, a cliff edge and a steep slope falling down to where the villagers of Hollow lay waiting with spears. Every now and then one of the soldiers would attempt the descent, but the villagers were more than a match for individual enemies. The second line of the army, the mages, archers and reserves largely stood in the relative cover of the cave mouth, firing from the top of the trail. I sprinted through the ranks of archers, cradling one of the drow, Terato and Vincent followed me closely. I'd lost track of the others. As I broke ranks with the army, I turned and swept my vision over the enemy smiling. Realisation dawned on their faces as they saw that we were carrying their leaders, and a cry of rage erupted. I saw Argent fly past me, a shadowy blur against the backdrop of the rock face, and the glow of Ayeena shot behind me. We had all made the run. I turned from the army, smiling at them as I did so, and lept from the cliff edge. The Descent was less than pleasant - I took countless minor injuries on the way down, focused as I was on the safety of my hostage. I saw that most of the rest of the group had also decided to leap from the cliff, and I could hear above me that a number of enemies had followed us directly. I hit the ground hard, and there was a stomach-turning crunch - something had given way in my left leg. I rolled forward, absorbing the rest of the impact along my back, sprawling out across the ground. I was met by a wall of spearpoints that quickly retracted when they recognised me. Ayeena had landed fairly lightly, and took custody of the prisoners. There was no time to think, so I hauled myself to my feet, wincing with the pain, and turned to help my childhood friends in battle. 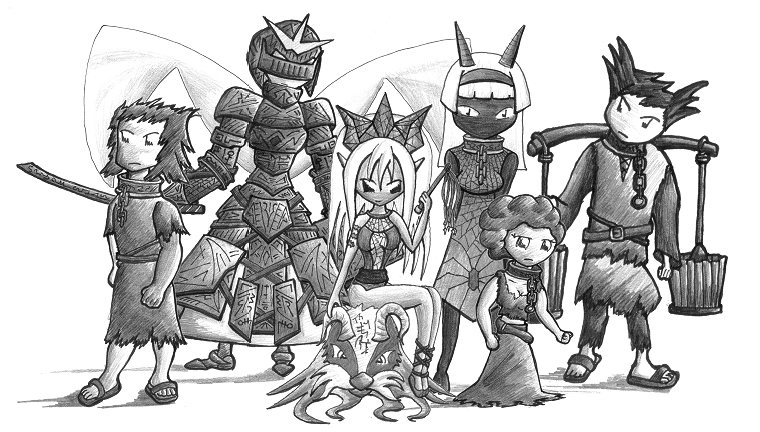 With five hardened adventurers directing and helping them, the villagers were easily able to cope with those monsters that had taken the direct route down the mountain. Argent had charged the back of the melee on the trail, then teleported behond the dwarven line, and was wrecking havoc on our enemies up above. Terato and Ayeena rushed to help her, while Marigold elected to take our prisoners and secure them within the village. Vincent fixed my knee, berating me for not using the drow to cushion the fall. I joined the army in battle, the fighting was long and bloody, and I gave enverything I had leading the troops in the fight. The slaves fought to the last man, they knew that if they turned and fled, then they would be destroyed by their collars. As the last of them fell to dwarven blades, I faltered, losing my feet to exhaustion, and sank wearily to the mud beneath my feet. There was but one of them left, a huge hulking troglodyte with patchy hide armour and a massive battle-axe. He stood proud and challenged our line. He wanted single combat, an honourable end. The dwarven army looked as a man to me for leadership, this would make a great end to a great saga, and they wanted me to take the leading part... as always. I was completely drained, there was nothing left in me, I had spent everything I had making sure that the army took as few casualties as possible - but I allowed myself to be dragged to my feet. Blinking the tiredness from my eyes, I tottered towards the champion, but as I stepped forward Ayeena rested a mailled hand lightly on my shoulder and looked into my face. She showed none of the fatigue of the last few hours. How? From her expression, it was clear that this was something she wanted to do. I nodded dumbly at her and gestured for her to take my place. the commander of the Dwarves of Halt took a place by my side and asked me if I was sure. "This is something she has to do." I mumbled, and turned to watch. It was clear to me from the outset that they were evenly matched. Ayeena had the edge in skill, but the troglodyte posessed a great deal more strength. It looked to me like the fight could go any way at any point, but Ayeena fought with confidence writ on her face, as if she was unaware of the huge danger each swing of that mighty axe brought. they fought ineffectively against each other for what seemed like an eternity, gradually tiring, getting sloppier, the elegance of the fight gradually giving way to brute strength. As I watched I became slowly more and more convinced that Ayeena was going to lose, but if I rushed forward to intervene, Ayeena's confidence would be destroyed. Besides, I was pretty sure there was a dwarf physically holding me up. I don't think I could stand. Just when it looked like the fight was well and truly turning, Ayeena made her move. She took a step back, digging her foot into the ground, and threw her arms open wide, throwing her guard away entirely, and allowing the champion to strike her cleanly. He rushed forward eagerly, swinging his battleaxe with every ounce of strength he had. As he did so, her sword flashed, neatly severing the collar that bound his neck. The axe crashed into her breastplate, and she fell to the ground in a massive spurt of blood. The champion turned to the crowd, dropping his weapon, and spoke. "I die. But I die free." He crumpled to the floor in a heap, not breathing. Dead. I don't know why he died, perhaps it was the removal of the collar, perhaps it was the exertion, but he had died instantly, on his feet. Ayeena was somehow still conscious, and pulled herself to her feet. A massive cheer erupted, and someone called for a speech. I'm told nowadays that the words I spoke were inspiring, beautiful, majestic - that my voice filled the listening ears with joy and hope. I'm told that I spoke of our victory and glory, and praised the valour of all who had fought. I'm told that I spoke words of respect, sorrow and grief for those who had fallen, and that the heavens themselves wept for our loss. Maybe that's all the work of the poets though. I'm pretty sure what I actually said was something along these lines: "Well done friends. It's finally over. There's a lot of work to do though. Vincent is in charge, make sure to help him clean up. And then I zonked out.